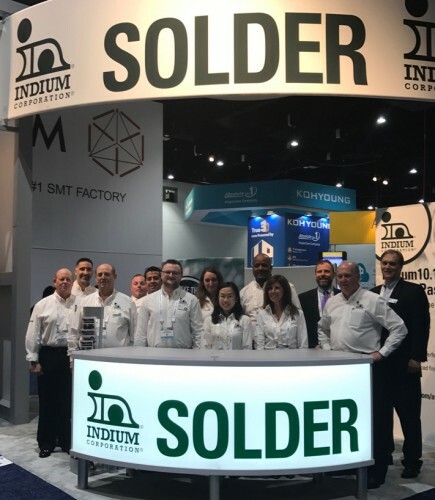 Indium Corporation has been named winner of the annual CIRCUITS ASSEMBLY Service Excellence Award for Materials at the IPC APEX Expo technical conference on February 14-16 in San Diego, Calif. The Service Excellence Awards recognize electronics manufacturing companies that, as judged by their own customers, demonstrate the highest performance across the areas of Technology, Responsiveness, Dependability, Quality, and Value for Price. "We're honored to be recognized for the dedicated service we strive to provide to our customers and the electronics assembly industry," said Patrick Ryan, Americas Sales Manager. Indium Corporation is a premier materials manufacturer and supplier to the global electronics, semiconductor, thin-film, and thermal management markets. Products include solders and fluxes; brazes; thermal interface materials; sputtering targets; indium, gallium, germanium, and tin metals and inorganic compounds; and NanoFoil®. Founded in 1934, Indium has global technical support and factories located in China, Malaysia, Singapore, South Korea, the United Kingdom, and the USA.